The Charles Leopold Mayer Foundation for the Progress of Humankind (FPH) supports AGTER for the building of a database and resource website on land, water, and natural resource governance and for the promotion of debates on this issue. realize travelling workshops. 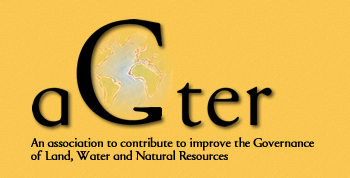 The first one took place in Mexico in 2008, the second one in the French Alps in 2009.
work with the "Water Program" and its partners on the issue of global governance of water. 2005-2006. AGTER carried out with the support of the ILC a review of 25 projects funded by the his CEF programme (Community Empowerment Facility) in 17 countries. [Albania, Georgia, South Africa, Zimbabwe, Zambia, Uganda, Malawi, Madagascar, Cameroon, The Philippines, Indonesia, India, Nicaragua, Guatemala, Ecuador, Chile, Bolivia]. 2009 Research in the Bolivian Amazon rainforest on the emergence or rights to natural resources and land. Pando, Bolivía.